This is our review of Nature’s Secret 7-Day Ultimate Cleanse. This product provides a 2-part cleanse that is meant to cleanse and detoxify your digestive tract. The first part is the Multi-Herb Digestion and Detox Support tablet and the second part is the Multi-Fiber Colon Cleanse tablet. These two tablets taken together will hopefully provide you with support for optimum health and a feeling of rejuvenation. Continue reading for our full review. These tablets contains dairy, soy, crustacean shellfish, and have no artificial colors or preservatives. These ingredients are meant to support digestive function and colon detoxification. The tablets are designed to promote healthy digestion and elimination.They also are meant to promote 2-3 bowel movements a day. It is recommended to take these two tablets together in the morning and evening with a full glass of water. One Day 1, you should take 1 tablet of both products in the morning and evening. On day 2, you should take 2 tablets of both products in the morning and evening. On days 3-7, you should take 3 tablets of both products in the morning and evening. You should not exceed a total of 6 tablets twice daily, meaning 12 tablets daily. If your stools are loose, you should decrease the dosage to 2 tablets of both products, twice daily. This product contains Cascara Sagrada. Cascara Sagrada may worsen the conditions of diarrhea, loose stools, and abdominal pain, so do not take if you have or develop any of these conditions. It can also cause nausea, abdominal cramps, rebound constipation, dangerously low potassium levels, impaired glucose metabolism, and discolored urine. This product also contains a chemical known to cause birth defects or other reproductive harm. If you pregnant, nursing, taking medication, or have a medical condition, please consult with you doctor before trying this product. Taking this product without an adequate amount of water may cause choking. This product is not intended for children under the age of 18. 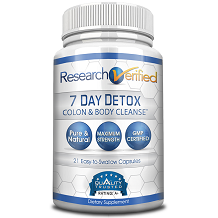 Nature’s Secret 7-Day Ultimate Cleanse costs $22.99 for a 7 day supply. This product is not intended for long-term use. We were unable to find a customer guarantee for this product which may mean that the manufacturer isn’t confident in this product’s effectiveness. It also may cause some hesitation in the customer. There are a couple of positive things about Nature’s Secret 7-Day Ultimate Cleanse. Since it isn’t meant to be used long-term, the one time payment of $22.99 isn’t so bad if it does provide good results. We also found a lot of positive reviews about this product. Customers said that this product was a great gentle cleanse that got the job done. There are also a couple of things that are cause for concern. There are a lot of possible side effects of taking this product and a lot of warnings as well. We also don’t know much of its effectiveness since we couldn’t find a guarantee. Without a guarantee, you are unable to buy this product with confidence. After doing all of our research we feel there are better products out there with less risk and therefore would not recommend this product.